An unusual inhabitant of our village pond is the midwife toad, so called because when the female toad lays her eggs (about 15 to 30) the male toad wraps them round his back legs and carries them about until they are ready to hatch, when he releases them into shallow water. 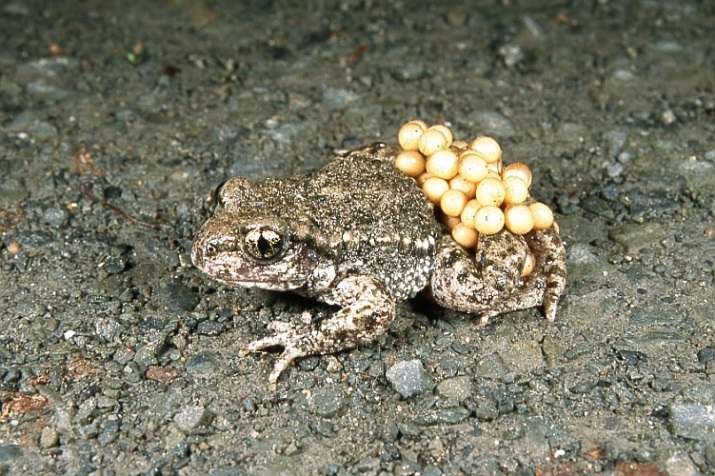 Most other amphibians leave their eggs in the water when and where they are laid. The midwife toad is not native to the UK, it’s a stowaway! It was accidentally introduced here in 1904 in a shipment of ferns imported from France and delivered to a plant nursery in Ashburnham Road, Bedford, and that’s where the toads first set up home in this country and began to breed. As their numbers grew, two young brothers, Robert and Percy Brocklehurst asked if they could have some of the toads for their garden in Bromham Road. They were released there and over time began to spread to other places round and about, including our village pond. Other people have since introduced the toads into their gardens and they are now quite widespread across the north of Bedford, and in Bedfordshire villages. Robert Brocklehurst later started colonies in Worksop and Oundle and the toads have been seen – and heard – in other parts of the country too. Their call is difficult to describe – it is not a croak like our native toad or frogs, but is more a bell-like peep or electronic bleep. It is surprisingly loud for such a tiny creature. Some people have thought it was an alarm going off somewhere, and others complain of sleepless nights! The toads are at their most vocal during April to October, at night and especially in warm weather. You may have heard them in Biddenham? The toads are tiny creatures, often about the size of a 50p coin. They spend most of their time on land, only really needing water when they are tadpoles. They come out at night to hunt for food, such as insects and worms, and live in burrows concealed under rocks. They hibernate in the wintertime. They look similar to common toads except their snouts are a bit more pointed and the pupils of their eyes have a vertical slit. Their skin colour can vary from grey to green to brown. Midwife toads are not protected by the law as they are an introduced and not a native species. Their scientific name is Alytes obstetricans.